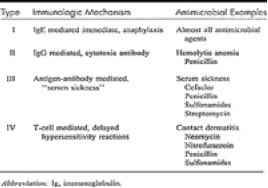 Almost all antimicrobial agents have resulted in immunoglobulin E-mediated anaphylaxis in sensitized individuals. Antibiotics, led by penicillins, account for the largest number of anaphylactic deaths in the United States annually.2 In addition to immediate hypersensitivity reactions, antibiotics may cause delayed hypersensitivity reactions (Table 18.0-3.). A comprehensive review of the presentation and management of hypersensitivity reactions is beyond the scope of this chapter, but they are important considerations when prescribing and caring for patients on antibiotics. Antibiotics account for the greatest number of adverse dermatologic drug reactions. Ampicillin and trimethoprim-sulfamethoxazole (TMP-SMX) are reported to be the most common offending agents.3 The mechanisms of these cutaneous reactions are not well understood but appear to be mediated immunologically. Most benign skin reactions begin within 1 to 2 weeks of exposure to the drug. 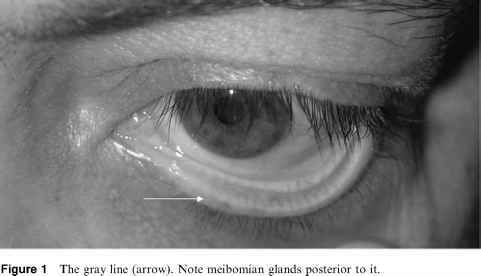 Rashes are often pruritic erythematous, morbilliform, or macular eruptions, which typically resolve within several days after administration of the offending drug has been stopped. Serious drug reactions are rare. Sulfonamides were recently implicated in a large case-control study as the drugs with the highest relative rate for development of the severe drug eruptions of Stevens-Johnson syndrome (SJS) and toxic epidermal necrolysis (TEN). The sulfonamides are estimated to account for 4.5 cases of SJS and TEN per million users of the drug per week.4 Other antibiotics significantly associated with SJS and TEN include cephalosporins, fluoroquinolones, tetracyclines, and aminopenicillins.